Pubs have been hit by supermarket discounts on alcohol, higher food and raw material costs as well as the smoking ban in England and Wales. Punch shares closed down 7.4%, or 13.5 pence, at 170p. The group's share price has fallen 80% over the past year as a result of concerns about the firm's financial position. "Trading conditions into September and October have, as expected remained extremely challenging," the company said. Rival pub group JD Wetherspoon fared a little better. 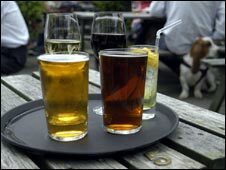 It said sales in pubs open for more than a year rose 1.5% in the 13 weeks to 26 October, which it deemed "an encouraging start" to its financial year. Punch's loss largely stemmed from a £295m write-down on the value of poorly performing pubs to reflect the slowdown in trading. This was "brought about by the change in the consumer market following the first full-year of the smoking ban" and "a weakened consumer environment," Punch said. Punch, which is based in Burton-upon-Trent and has 8,400 outlets, said it had taken steps to strengthen its financial position. Punch said net debt had fallen to £4.5bn. It announced in September that it would scrap a year-end dividend to shareholders. Many consumer-related firms are having a tough time as the UK's economic growth slows and demand declines. The global credit crunch has seen many banks tighten up their lending criteria, limiting the amount of money companies and consumers can borrow. As a result, many companies have had to rethink how they finance their operations, and how they repay existing debts.